GcMAF is an essential human protein our bodies naturally make to destroy cancer. All 5 billion healthy humans make their own GcMAF. A human makes 10,000 – 100,000 cancer cells a day, but your GcMAF, which has six attacks on cancer, destroys them every day. If you have a severe shock, such as losing your job, your home, or a loved one, or your immune system is compramised due to an infection, or influenza, your body sends out an enzyme (nagalase) to prevent your body making its own GcMAF. If so, that stops the potential six attacks you have on cancer that GcMAF has and without it your immune system also collapses, and the cancer is left to grow and become a chronic illness. Unlike 1st generation GcMAF, 2nd generation can be used in a nebuliser (the most powerful form of administration), and made into suppositories. It also isn’t blocked by medicines such as heparin. We design Protocols that will support the GCMAf, while the biggest part of the treatment should always be diet, providing the patient carries out the protocols and does not feed the cancer with sugar, or processed foods, we usually eradicate stage 4 cancer in 6 months if the patient truly sticks to an organic vegan diet with no sugar. If you have had chemotherapy it will take considerably longer. If you have been “over chemoed” and your blood / immune system counts are low, we will have to get those back up first. Externally administered heparin (used to stop blood clots) can completely block GcMAF, but not 2nd Generation GcMaf. we recommend a vegan diet, no processed foods. NO sugars and no sugar replacements. We treat usually terminal stage 4 cancer patients, including multiple myleoma and pancreatic cancer. We expect you to have, a reduction in tumour size (50% improvement in myleoma numbers) in three weeks. A full 1ml of GcMaf a day. vitamin D daily, amount will depend on you disposable vitamin D levels by taking a 25 hydroxy blood test. If your weight drops below your ideal, D Ribose will be given. Stay away from: sugar, which feeds cancer, carbohydrates which turn into sugar; and grains beans and potatoes, which also contain cancer inducing lectins and poisons – wheat is the worst. Avoid soya milk which blocks the absorbance of trace metals. sweeteners are damaging in other ways – asparthame lowers your immune system; even Splenda is a chlorocarbon like DDT – Seehttp://www.wnho.net/splenda_chlorocarbon.htm. If you have a root canal, you are advised to have that tooth removed. Dangers of root canal fillings. If you have a amalgam fillings, you are advised to have that tooth removed Dangers of Amalgam fillings. 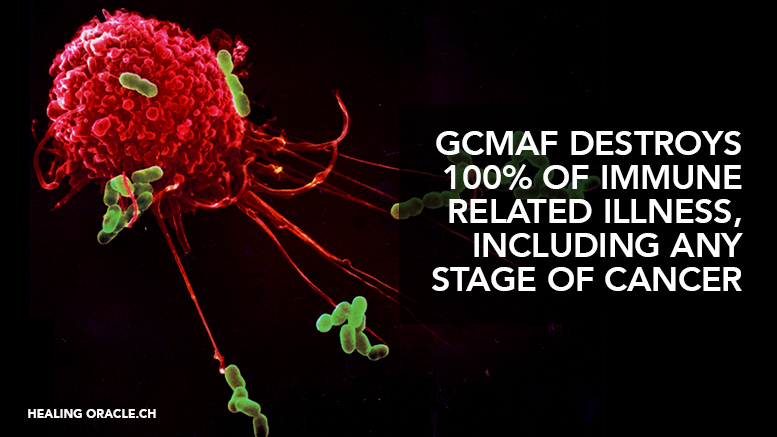 In addition to rebuilding the immune system and activating macrophages, 2nd generation GcMaf also has five direct actions on cancer cells, where its half life is three days. As a macrophage stimulator its half life is 5 days (the half life of macrophages is 6 days), so most importantly hugely increase the GcMAF dosage, and put into different parts of the body at least twice a week. IV is best. If you can have surgery to reduce tumour mass, do so, but make sure you are on GcMAF for at least three weeks before the surgery, so that your rebuilt immune system can prevent secondaries caused by cancer cells released by surgery settling elsewhere. Please also see our GCMaf section for related articles.